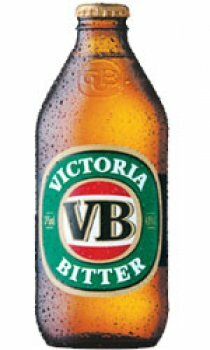 Australia's favourite full strength beer, Victoria Bitter or VB as it's fondly known, has a tradition of rewarding hard work and hard play, dating back to the 1890s. Over the last 10 years, it's been a consistent winner in the esteemed Australian Liquor Industry Awards (ALIA), more recently picking up "Best Full Strength Beer" in 2001, "Tap Beer of the Year" in 2002, and "Best Full Strength Beer" again in 2003. VB is a full flavoured brew, less malty in character and slightly darker than CUB's traditional lagers. A gentle fruitiness in the aroma complements the sweet malt on the mid-palate balancing perfectly with a robust, hop bitterness.